Added WCF Service Reference. But where is Reference.svcmap and Reference.cs? I am accessing a WCF service from a client. The client is configured properly to access the proxy. However, I am expecting to find 2 files (reference.svcmap, reference.cs) under the SERVICE REFERENCES folder in Visual Studio 2012. Instead, I can only see a localhost (this refers to the namespace of the client proxy created). From where do I see reference.svcmap and reference.cs? 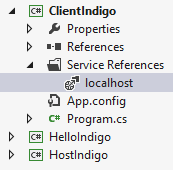 You need to highlight the project (ClientIndigo) in the solution explorer, and then click on the Show All Files button in the toolbar at the top of Solution Explorer. Those files are "nested" below the service reference, and not shown by default.